This is how Drink, Shop & Do describes itself, and this London tea spot certainly does offer a wide variety of entertainment. As well as serving food and drink, it hosts a range of events from dancing, to poetry readings, to arts and crafts activities, to live DJ sessions. But it was their food and drink that was my focus on a recent visit—or, to be specific, their tea. Drink, Shop & Do has a lovely selection of loose teas, which are ordered by the pot. In addition to the unflavoured black teas, several flavoured black teas sit alongside a range of rooibos infusions, a white tea, and a standard (but still tasty) Japanese green tea (they did not specify which one, but my guess is a sencha). I was there with a few friends and since we ordered different teas I was able to sample more than just one of Drink, Shop & Do’s offerings. I ordered the green tea (the suspected sencha), and it was no more nor less than what I would expect: the slightly sweet, grassy taste of green tea came through clearly, and the presence of an infuser allowed me to steep it to my preferred strength. One tea companion ordered the chai — not a traditional Indian masala chai, but a black tea flavoured with various spices. It was very aromatic, and flavourful to boot; the spices were deliciously strong. However, if you are not partial to strongly spiced teas, this chai may not be one that you would enjoy. The third tea drinker in our party ordered a classic: Earl Grey. This Early Grey blend had a decently strong black base, which meant that, although it was still aromatic, for me this would be a morning brew rather than a light afternoon tea. But since I find it hard to go wrong with an Earl Grey, this tea certainly got my approval. Perhaps one of the most enjoyable things about Drink, Shop & Do is its décor. 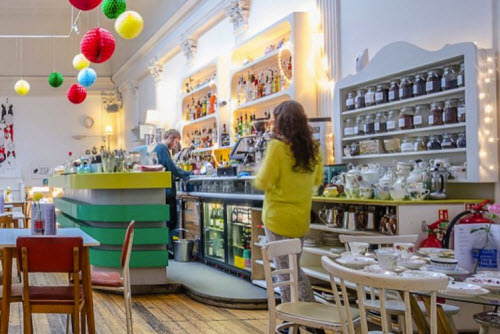 The furniture is charmingly mismatched, and the colourful interior gives the café a fun vibe. The mismatched theme continues in their teawares, and it is always a lovely surprise to see what style of teacup and teapot your tea will arrive in. And, significantly for this tea drinker, most of their teapots are very generously sized. One of our party actually found himself unable to finish his pot—not a common occurrence, I can assure you! But fear not, the unwanted tea did not stay unwanted for long. Tempting. Perhaps I’ll sample some of those on my next visit. Can’t get to London? Shop for the same tasty teas here.